Passover is a major eight day festival celebrated in the month of Nissan. We are remembering the emancipation of the Israelites from slavery in ancient Egypt. We try to relive that experience and realize the true freedom that our ancestors gained through Seders. The Israelites were slaves to the Egyptian pharaohs for many years and were subjected to backbreaking labor and unbearable horrors. Moses Also known as Pesakh the Jews recount their Exodus from Egypt and the liberation from slavery that leads directly to 40 years of wandering in the wilderness and finally ends in Canaan, Israel. Charoset: Traditionally made from chopped nuts, grated apples, cinnamon and sweet wine, this sweet brown mixture represents the mortar used by the Jewish slaves to build the storehouses of Egypt. It is sweet because sweetness is symbolic of God’s kindess, which was able o mak slavery more bearable. According to legend, the use of apples in charoset stems from Pharaoh’s decree that all male Hebrew children were to be killed at birth. Mothers would go out to the orchards to give birth, and thus save their babies from the Egyptian soldiers. Beitzah: The roasted egg is symbolic of the festival sacrifice made in biblical times. On Passover, an additional sacrifice, (the Paschal lamb) was offered as well. The egg is also a traditional symbol of mourning, and has been interpreted by some as a symbolic mourning for the loss of the Temple. Since the destruction of the Temple in the year 70 C.E. neither the festival sacrifice nor the special Passover sacrifice could be offered. It is also a symbol of the spring season in which Passover is always celebrated. Zeroa. The shankbone is symbolic of the sacrificial lamb offered as the Passover sacrifice in biblical times. The Israelites marked the doorposts of their homes with the blood of a lamb as a signal that death should pass over them. Chazeret: Lettuce is often used as the bitter vegetable. The commandments in Numbers 9:11 instruct us to eat the paschal lamb “with unleavened bread and bitter herbs” uses the plural (“bitter herbs”). Karpas : Vegetable (usually parsley) is dipped into salt water during the seder. The salt water represents the tears shed during Egyptian slavery. The dipping of a vegetable as an appetizer is said to date back to biblical times. It may now be identified with the biblical description of the Hebrew slaves marking their doorposts at the time of the first Passover. A bunch of hyssop was to be dipped in the blood of the sacrificial lamb and used to strike the lintel and the doorposts (Exodus 12:22) so that the tenth plague (the death of the firstborn) would pass over the Jewish households. For seven (or eight) days Jews avoid all bread items and foods containing wheat, oats barley, rye and spelts. The matzah is the unleavened bread that is eaten during Passover. It symbolizes the freedon and the slavery. The Israelites “baked unleavened cakes of dough which they brought froth from Egypt..for they had been driven out of Egypt and could not delay..” Exodus 12:39. 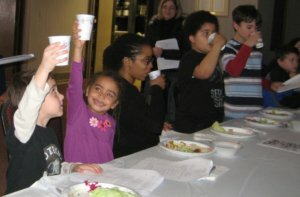 Our Religious school students learn the importance of Passover with the Passover Model Seder led by Rabbi. This is a wonderful learning opportunity that is shared with the parents. 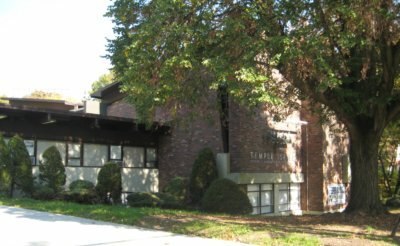 We also hold a full Passover Seder opened to the community on the first evening of Passover at our Temple’s Social Hall. Reservations are required. Information on this will be on the calender as we get closer to the date of the event. 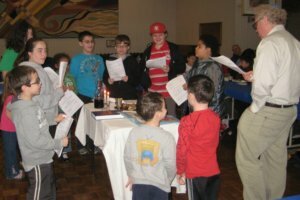 Yizkor Service followed by Kosher for Passover Bring a Dairy to Share Dish.